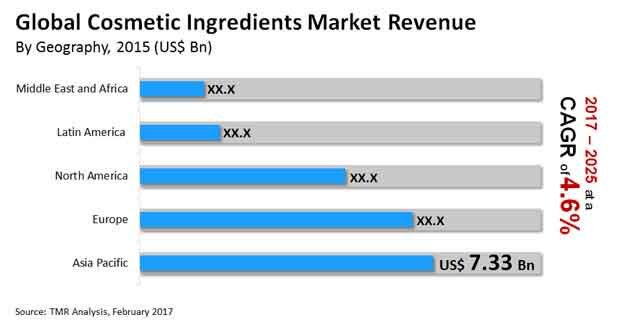 The global cosmetic ingredients market is expected to be intensely fragmented due to the presence of various players in the global and regional market. The competition among the players seem to be extremely tough in order to sustain their position in coming yes. Some of the major players leading the market are AkzoNobel, The Dow Chemicals, Croda International, Lonza Group, Clariant AG, Solvay SA, Evonik Industries AG, Innospec Inc., and Ashland Inc. The completion between the key players is foreseen to toughen in the upcoming years as well. According to the research report by Transparency Market Research (TMR), the global market for cosmetic ingredients is estimated to expand at a steady 4.60% CAGR during the forecast period from 2017 to 2025. The market was valued to be of worth US$22.89 bn in 2016, and is expected to reach around US$33.80 bn by the end of forecast period. The major usage of cosmetic ingredients are as moisturizing agents, cleansing agents, and coloring agents. Out of these, the moisturizing agents segment accounts for the most important share in this market, owing to the rigorous use of moisturizing compounds in hair care, makeup, and skin care cosmetics. The analysts are expecting the scenario to be the same in future as well. Geographically, in 2016, mainly supported by India, Japan, China, and the Rest of Asia Pacific, the region dominated the global market with a collective share of 32.02%. This is attributed to the growing economy of the nations in Asia Pacific region which is shoeing in their living standard and spending capacities as well, propelling the market growth. Owing to the rise in disposable income of customers, there has been an enhancement spending abilities and aesthetic cognizance. This has surged the demand for cosmetic ingredients to a large extent. Their desire to look good all the time over the years is driving the revenue of cosmetic products significantly all across the globe, which unavoidably, is intending towards a positive angle on the surging demand for cosmetic ingredients. The rise in consciousness regarding healthy skin and the surging utilization of anti-ageing cosmetics are in in a way boosting the overall cosmetic ingredients market altogether. Cosmetic ingredients are essentially utilized as cleansing agents, moisturizing agents, and coloring compounds. Out of these, the moisturizing agent segment accounts for maximum share in this market, by virtue of the increased usage of the mentioned segment in hair care, healthy skin, and cosmetic beauty products. Researchers anticipate that the circumstance will remain same all through the accompanying couple of years. Even though the market is expected to grow substantially in coming years, the delay in the approval of stringent standards, standardizing the utilization of a couple of medical compounds may hamper the improvement of this market in future. By the by, the changing tendencies of buyers, as for the shape and their physical appearance, are most likely going to make lucrative improvement scope for the makers of cosmetic ingredients in the years ahead normalizing the effect of the hindrance. Owing to the rise in disposable income of customers has surged the demand for cosmetic ingredients to a large extent. The rise in consciousness regarding healthy skin and the surging utilization of anti-ageing cosmetics are in in a way boosting the overall cosmetic ingredients market altogether.